Spark. Wow, this was a book to make. This is my first real sort of serious-ish book but it was actually a lot of fun to create! This was partly because when I wrote it I was thinking about my Grandmother, who also wrote children’s books. It was also because I have never seen a book about a fire like this before, so it felt like I was making something truly original. It was also also because I got to work with Andrew Plant, the illustrator, who I just think is a superstar legend illustrator and champion guy, and we laugh heaps when we hang out, so that was awesome. Also always brilliant to work with Ford St Publishing! 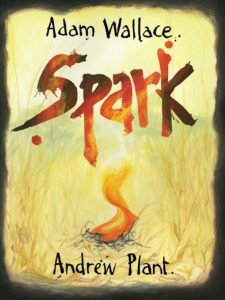 On March 1, 2017, I was SO happy to see Spark listed as a notable book in the CBCA Picture Book of the Year category! This was such a thrill. There are two steps to go to win it, but we are in it! Spark is on the NSW Premier’s Reading Challenge List! Target Age: Primary school level.